The Salzkammergut area (Austria's Lake District) is one of the most impressive regions in the heart of the country. Boasting 76 lakes and with a beautiful mountain backdrop, it's a perfect place to relax and let the calming atmosphere envelop you. This 7-night self-guided walking holiday offers a selection of activities, where you'll enjoy a mix of spectacular scenic views, gentle shoreline routes, wooded forest trails and 'chocolate box' villages. There are also some great spots to stop off for a swim or dip your toes after a day's walking. The walks are relaxed, following mainly well-marked routes, and you can extend them on most days. You'll spend seven nights in the wonderful riverside spa town of Bad Ischl - a favourite summer holiday retreat of Emperor Franz Joseph. Although it's almost 100 years since the emperor was last there, his presence is still felt in the region, and you can explore the Kaiservilla, his former holiday home. Other highlights include walking via the UNESCO village of Halstatt for picture-postcard views, the imperial spa, salt mines, ice cave, the Katrin cable car and the Siriuskogl viewing platform. Stop off at the town of St Wolfgang, renowned for its beautiful 15th-century church (you can sit in the arched windows and enjoy your lunch al fresco from here), and hop on the antique cog railway up to the summit of the Schafberg for unrivalled Alpine views. Visit St Wolfgang's Pfarrkirche with its outstanding Baroque altar created by Michael Pacher. Unrivalled **** luxury at the family-run Hotel Goldener Ochs, a calm and relaxing place to spend time, with a 'feel-good' wellness centre and a panoramic terrace overlooking the River Traun. These walks are mainly easy and follow well marked routes, however there are some forested sections where the terrain is inclined and loose under foot. Walking boots are recommended. Two circular walk options direct from your hotel; one to Kolowratshohe, a lesser-known peak above Bad Ischl, with spectacular views and the added bonus of a mountain restaurant at Hoisenrad. Or, a picturesque walk to the summit of Jainzenberg, rising directly behind the Kaiserpark and the Kaiservilla. Hop on a local bus to Wolfgangsee, with the option of walking up to the Vormauerstein and the breath taking views of the Schafberg and the Lake Attersee. Picnic on the shores of Monichsee. Alternatively, a leisurely route up to the stunning Schwarzensee for lunch at one of the restaurants and lake views. This option gives you more time to visit the charming village of St Wolfgang. Today visit the spectacular alpine village of Hallstatt, a UNESCO World Heritage Site and the oldest village in Austria. Take the panoramic funicular railway up the mountain and visit the historical salt mine. Use the ferry to cross the lake and follow a beautiful walk to Bad Goisern before returning to Bad Ischl by train. A bus ride brings you to the delightful village of St Gilgen. A thriving lace-making centre in the 1700s, today St Gilgen is a delightful village with a busy waterfront, lined with restaurants. Mozart's mother was born here and you can visit her house, which now includes a small museum. Or go by bus to explore the fairytale city of Salzburg, or the train and tram to the pottery town of Gmunden to visit the ceramic factories or the impressive Schloss Ort. Walk (2km) or take the cable car from Bad Ischl and visit the three summits of Katrin, Hainzen and Elferkogel. Sure footedness is required, but from the peaks you are rewarded with an incredible 360Â° panorama as far as the snow-capped Dachsteins. Sit and take in the superb vistas from the two restaurants at the top cable car station. After a longer journey to get there, the reward of the incredible Dachstein mountains are well worth it! A shorter walk allows you to visit the ice caves (payable locally) and spend time at the 5finger viewing platform. The second more strenuous walk is along a well-kept path towards Oberfeld, ascending through pine trees to the ridge of the Niederer Rumpler and on up to the saddle of the Taubenkogel with its large summit. 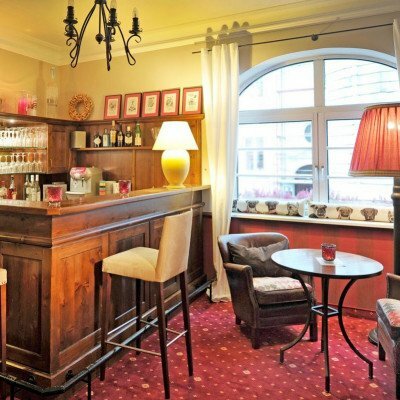 The Hotel Goldener Ochs boasts a prime location in Bad Ischl's pedestrianised town centre, and sits on the banks of the Traun River. It features a spa, sauna, swimming pool and sun terraces with mountain panorama. The 4 star Markus Sittikus is a beautifully presented hotel, based in an 18C building with a mustard facade located in a quiet side street not far from the Mirabell palace, just a 15 minute walk from the old city. Inside the hotel the decor is attractive and individual, with bold colours like mustard yellow and red tartan in the comfortable bar area, and some colourful murals painted on the walls throughout the building. Public rooms have period furniture and the upbeat interior, combined with the personal attention you receive from the friendly staff, make a stay here particularly memorable. The hotel has 39 rooms though it feels smaller, with television (CNN/BBC), direct dial phones and hairdryers. Each one is individually decorated with attractive colour combinations and solid wooden furniture, in keeping with the age and status of the building. It is also one of the few hotels in Salzburg to have a garden to relax in, if you are looking for some respite after doing the sights. 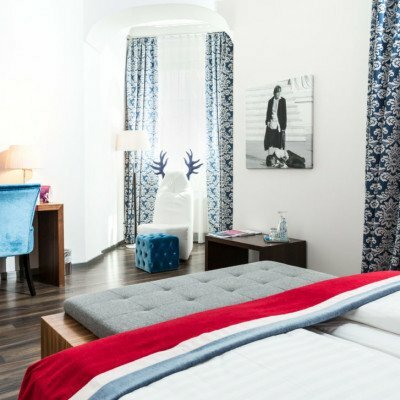 A 15-minute walk from Getreidegasse shopping street, this upscale hotel is 14 minutes from Mozart's Birthplace. Featuring elegant modern decor, the polished rooms and suites come with free Wi-Fi, flat-screen TVs, iPod docks and desks. Some upgraded rooms have balconies and/or in-room tubs, while suites have living areas. Transfers included from Salzburg airport at 13:35, and back to Salzburg airport at 11:45. Here at Headwater we thrive on feedback from our customers. It's the only way we can continue to develop, and where necessary improve, our services and ensure our holidays continue to be the best they can be. However, as this is a relatively new holiday, we don't yet have any customer reviews available. Self-guided walking Managed locally by Headwater appointed rep.
Every Saturday from 18th May 2019 to 12th Oct 2019, for 7 nights. All dates are subject to availability, please contact us to check. There are direct flights with British Airways from Gatwick to Salzburg Mondays to Saturdays which we can arrange, please call for details. Twin-bedded rooms in Austrian resorts are normally one large base with two mattresses/duvets. These are also known as 'Austrian Twins' and are regarded as two beds. Separate twin beds are rare and cannot be guaranteed as available. Due to the tailor-made nature of our holidays, we need a little more information in order for us to check availability for . Simply complete the form below and a member of our sales team will contact you (when it's most convenient for you) to provide availability information, travel options and an accurate price. Of course there's no obligation, but if you do wish to proceed with a booking they will be on-hand to assist you throughout the process. When should we contact you ---Monday 9am - 1pm Monday 1pm - 5pm Monday 5pm - 7:30pm ---Tuesday 9am - 1pm Tuesday 1pm - 5pm Tuesday 5pm - 7:30pm ---Wednesday 9am - 1pm Wednesday 1pm - 5pm Wednesday 5pm - 7:30pm ---Thursday 9.30am - 1pm Thursday 1pm - 5pm Thursday 5pm - 7:30pm ---Please reply by email We can call you when it's most convenient for you, or contact you by email if you'd prefer. During busy periods we cannot always guarantee a specific call time but we promise to try our very best.